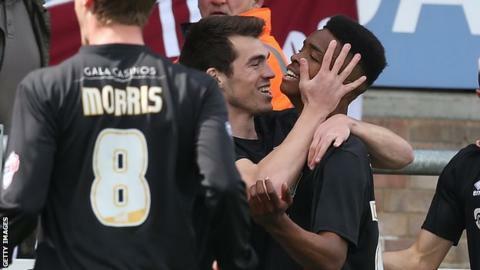 Teenager Ivan Toney scored his first ever senior goals to defeat Dagenham and pull Northampton Town out of the League Two relegation zone for the first time since September. The 18-year-old headed in a cross from Ian Morris, who then scored one himself with a spectacular long-range effort. Toney, making his second league start, then netted a stunning overhead kick with his back to goal. Daggers had a Luke Norris header saved, but the Cobblers edged towards safety. Visiting keeper Matt Duke also had to save from Medy Elito and at the other end Chris Hackett's free-kick was kept out by Jordan Seabright. With Wycombe losing to fellow relegation rivals Bristol Rovers, Northampton boss Chris Wilder can now preserve his side's Football League status with a point from next week's visit of Oxford United, the club he opted to quit in January. "We couldn't have asked for anything more. They were three quality goals and we've had fantastic support. "Ivan Toney gave us a spark last week and he deserved to play, regardless of his age. Both he and John Marquis set us off on the front foot. "We had to pick the right side and the right tactics today, and we've got the result. Now we have to do the same again next week." Match ends, Dagenham and Redbridge 0, Northampton Town 3. Second Half ends, Dagenham and Redbridge 0, Northampton Town 3. Foul by Brian Saah (Dagenham and Redbridge). Emile Sinclair (Northampton Town) wins a free kick in the defensive half. Foul by Lawson D'Ath (Dagenham and Redbridge). Darren Carter (Northampton Town) wins a free kick in the defensive half. Substitution, Northampton Town. Kelvin Langmead replaces Chris Hackett. Substitution, Dagenham and Redbridge. Blair Turgott replaces Luke Norris because of an injury. Attempt blocked. Luke Norris (Dagenham and Redbridge) right footed shot from the centre of the box is blocked. Luke Howell (Dagenham and Redbridge) wins a free kick in the attacking half. Foul by Emile Sinclair (Northampton Town). Substitution, Northampton Town. Leon McSweeney replaces Ivan Toney because of an injury. Richard Ravenhill (Northampton Town) is shown the yellow card. Abu Ogogo (Dagenham and Redbridge) wins a free kick in the attacking half. Foul by Richard Ravenhill (Northampton Town). Attempt missed. Luke Howell (Dagenham and Redbridge) right footed shot from outside the box misses to the right. Substitution, Northampton Town. Emile Sinclair replaces John Marquis. Foul by Darren Carter (Northampton Town). Abu Ogogo (Dagenham and Redbridge) is shown the yellow card. Foul by Abu Ogogo (Dagenham and Redbridge). Zander Diamond (Northampton Town) wins a free kick in the attacking half. Attempt blocked. John Marquis (Northampton Town) right footed shot from the left side of the box is blocked. Femi Ilesanmi (Dagenham and Redbridge) wins a free kick in the defensive half. Foul by Zander Diamond (Northampton Town). Substitution, Dagenham and Redbridge. Lawson D'Ath replaces Femi Ilesanmi. Corner, Northampton Town. Conceded by Jordan Seabright. Attempt saved. Chris Hackett (Northampton Town) left footed shot from outside the box is saved in the bottom right corner. John Marquis (Northampton Town) wins a free kick in the defensive half. Foul by Luke Howell (Dagenham and Redbridge). Brian Saah (Dagenham and Redbridge) wins a free kick in the attacking half. Foul by John Marquis (Northampton Town). Corner, Northampton Town. Conceded by Gavin Hoyte. Medy Elito (Dagenham and Redbridge) wins a free kick in the defensive half. Attempt missed. Luke Howell (Dagenham and Redbridge) right footed shot from outside the box is too high. Luke Norris (Dagenham and Redbridge) wins a free kick in the defensive half.